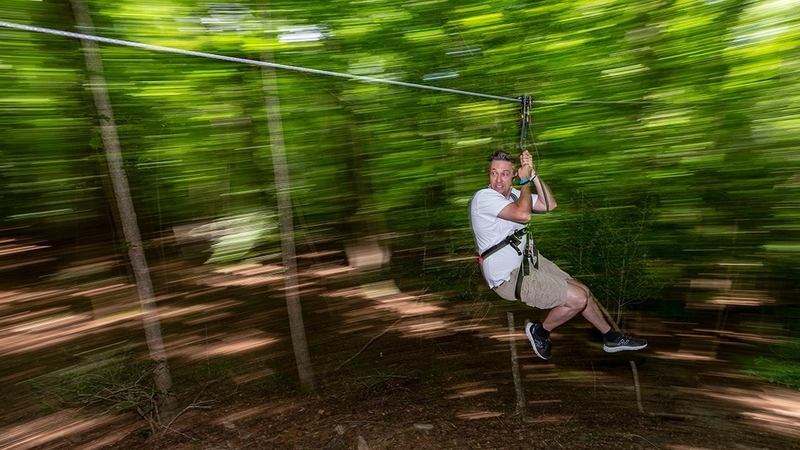 Terry Arwood rides a zip line at Go Ape in Raleigh. Perched on a small wooden platform jutting out from a tree towering 40 feet above the ground, Ileana Ovalle smiles nervously and leaps off. She catches hold of a thick white rope suspended almost 8 feet in front of the wooden platform and clings tight. Cheers erupt from her coworkers below. She chuckled in relief as she was lowered to the ground using two safety ropes attached to her harness. Ovalle had finished the Leap of Faith at the Bond Park Challenge Course. Google Fiber coworkers prepare to catch a teammate swinging toward them at Bond Park’s Challenge Course. 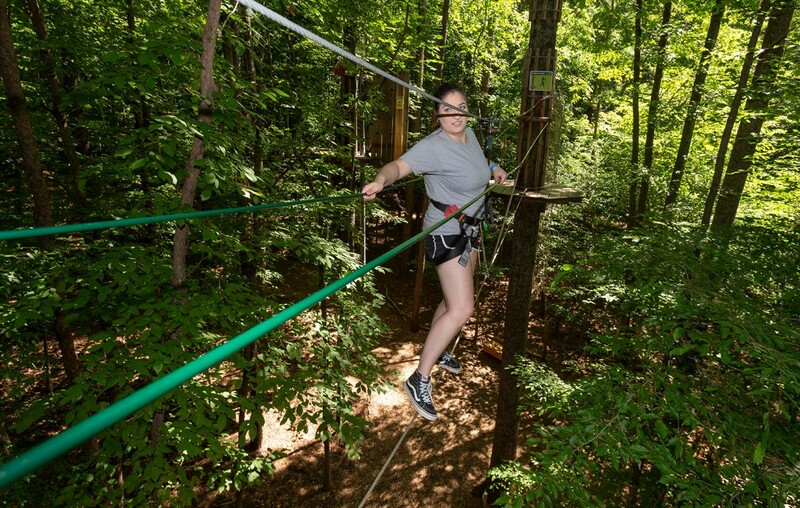 The Cary ropes course is one of three in Wake County, along with Go Ape and TreeRunner Raleigh Adventure Park. 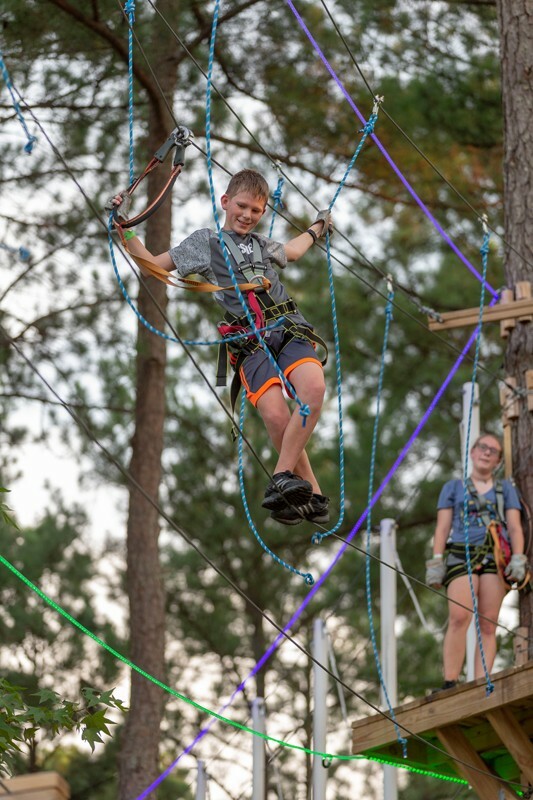 Sometimes called challenge courses or adventure parks, they consist of ropes activities ranging from climbing obstacles and balancing on platforms, to jumping into nets and careening down zip lines. Each course offers participants the chance to get outside, exercise and push their limits physically and mentally. Ileana Ovalle is rigged with safety lines, but jumping off a tiny tree platform at Bond Park takes a leap of faith. 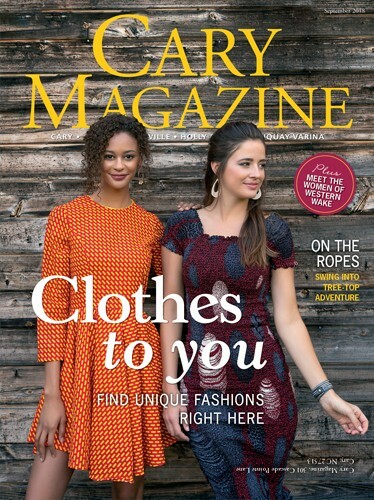 Rooted in the experiential and educational side of ropes courses, Cary’s course offers several hours of staff-facilitated high and low ropes activities. Whether it’s teammates, coworkers or families, groups can choose what type of experience they want. 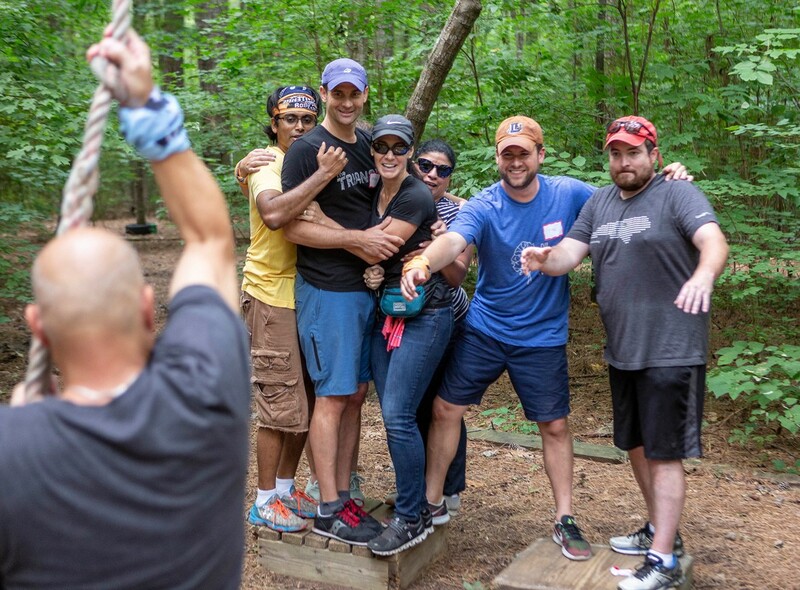 “Sometimes it’s just a fun company outing, and other times they are really looking for a learning experience to help them become a more effective team within the organization,” said Tracey Filomena, the course’s program specialist. In the team-building outings, the group is guided by a facilitator through each activity. After each challenge, the facilitator asks members to reflect on their experience and to relate it to participants’ day-to-day lives. This was the case for Ovalle and her fellow employees from Google Fiber. Google Fiber employee, Lea Sheridan, watches a coworker navigate the ropes course at Bond Park. For Ovalle, the lesson was the surprising strength of her team. 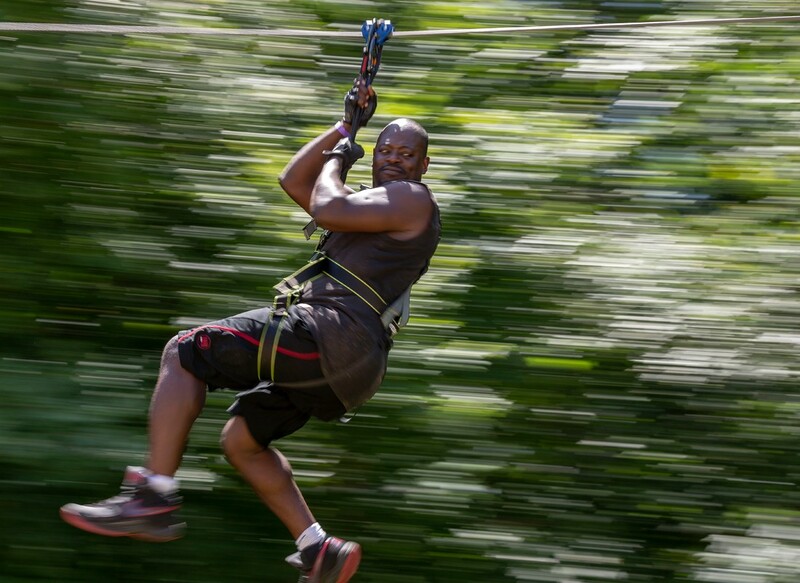 Lamond Heartwell of Durham rides a zip line at Go Ape at Blue Jay Point County Park in Raleigh. It’s all about adventure at Go Ape. From start to finish the main course is meant to challenge and thrill. 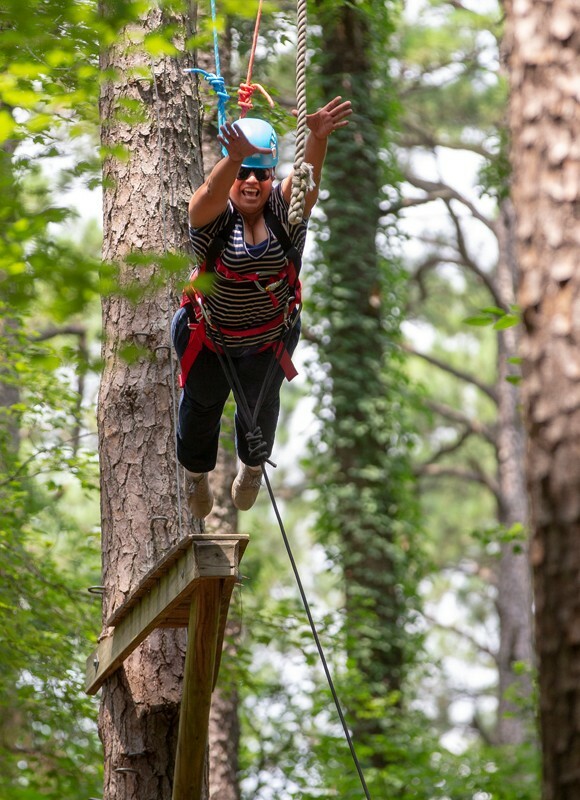 The facility, located in Blue Jay Point County Park in north Raleigh, allows participants to explore the treetops using a variety of bridges and zip lines. Go Ape aims for a high-energy adventure high up in the trees. “It’s a workout, but at the end of it you have big smiles and lots of cheers and lots of good endorphins going,” said Chip Schlegel, course manager. Jay Elliott works to keep his balance walking a tight rope at TreeRunner Raleigh Adventure Park. The course is divided into sections. When starting each section, patrons must climb a ladder to reach the treetop level where platforms and bridges are installed. Some sections have junctions where participants can opt to take more difficult routes to reach the end. In order to reach the bottom, climbers hook onto the zip line and zoom to the ground. “When you put a height element into an adventure activity, it adds a whole other level of experience,” Schlegel said. Amy Dietrich and her children Sam, 16, and Alex, 14, can’t get enough of the course and have visited four times. “It’s fun, it’s challenging and we love doing the zip-lining,” said Dietrich. But adventure isn’t the only priority for Go Ape. Giving back to the community is part of the company’s values. The company’s roughly 200 locations worldwide are always located inside city, county or state parks. Katelyn Arwood scales a cable between trees at Go Ape in Raleigh. 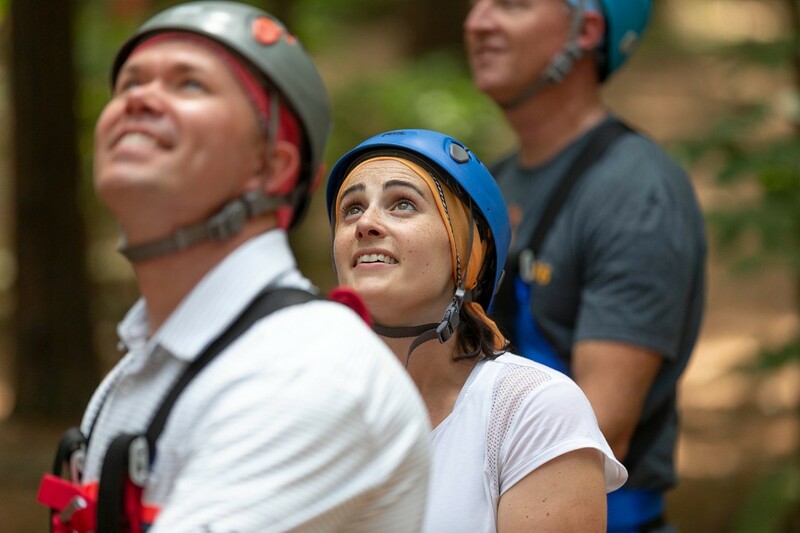 Located on the Raleigh-Cary Jewish Community Center campus, TreeRunner offers both a general climb option and a guided team-building experience. Comfortable clothes: Wear long shorts or athletic pants and closed-toed shoes. Water bottle: During hot days, staying hydrated is key. Hair tie: If you have longer hair, it is helpful to keep it up and out of the way. The general climb includes seven course routes of varying intensity from easy to expert. Group team building at TreeRunner also incorporates climbing, with a learning experience tailored to each group’s goals. “We have different courses that you can go down, that can serve not only anyone, but can also serve your range of difficulty that you’re looking to accomplish for the day,” said Erica Erway, TreeRunner’s course manager. Among the attractions at TreeRunner, Glow Nights are the crowd favorite, Erway says. From 5:30 to 11 p.m. Thursdays, Fridays and Saturdays, participants can climb in the dark while surrounded by string LED lights along every course route. “You are able to come out and climb at night, which is really fun and gets you to be outdoors when it’s cooler outside,” she said. 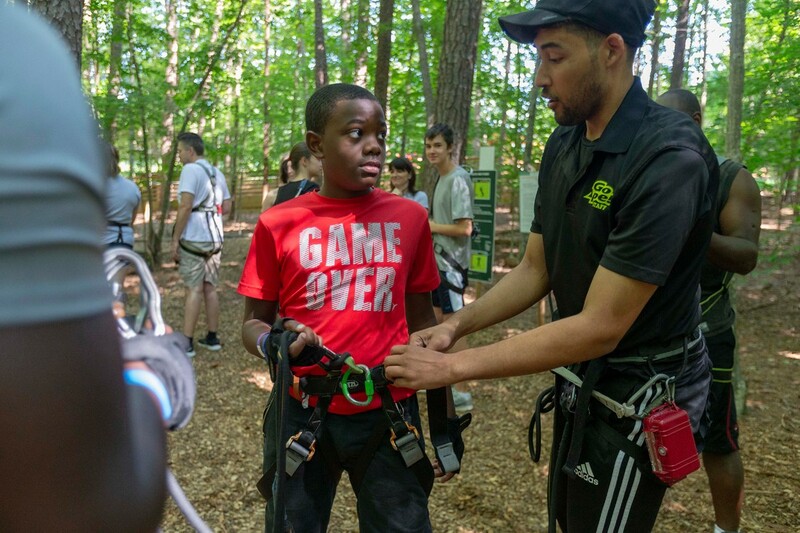 Joshua Heartwell, 11, learns about ropes course safety from Go Ape instructor Dylan Gatete. Whether it is day or night, Erway says the course is an experience worth having. “People should come out to the course because not only is it a lot of fun, but you learn a lot about yourself and about life throughout your time at the course,” she said. Haven’t had enough fun yet? Check out more photos from local ropes courses. 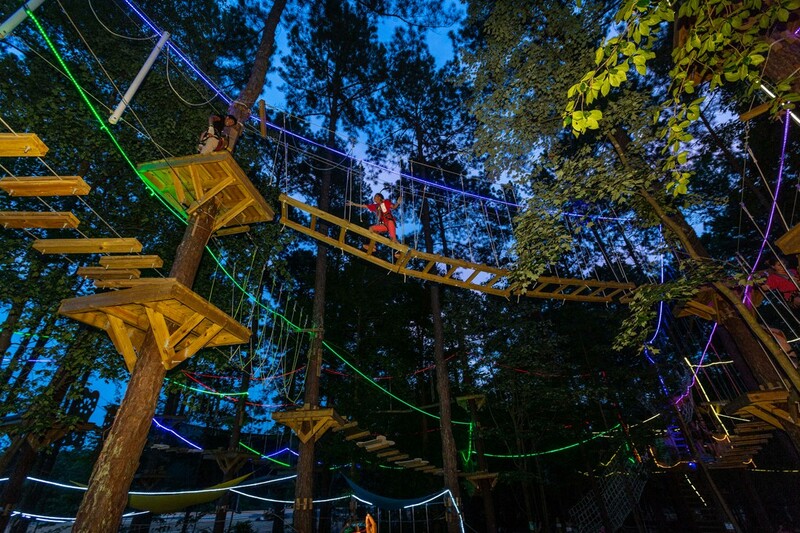 TreeRunner’s Glow Nights are a popular, cooler alternative to daytime ropes courses. Rúa American Single Malt Whiskey from Great Wagon Road Distilling Co.